Documentation: Photograph: 25 Mar 2011 Hall Co (Brogie 2013). 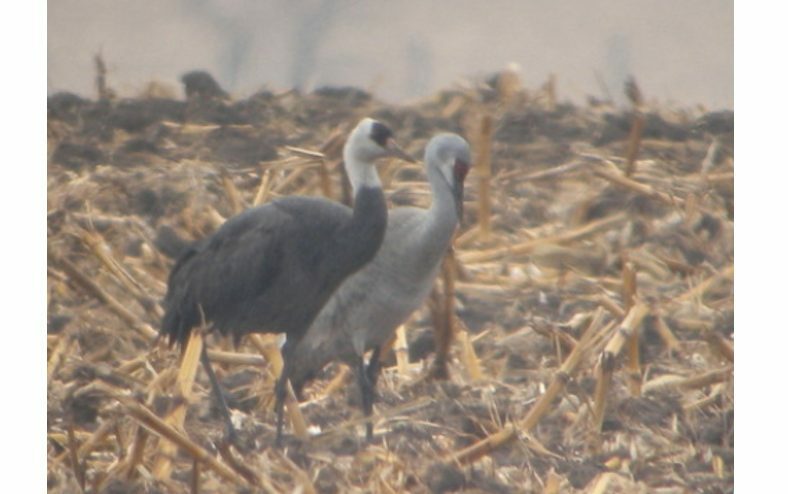 Record: In 2011 an obliging Hooded Crane chose to forage in fields next to Interstate Highway 80 in Hall Co with Sandhill Cranes for 17 days, allowing many observers to see this unexpected visitor. It was found 25 Mar by Chuck Cooper on West Platte River Drive, photographed 7 Apr by Walter Wehtje and Paul Dunbar, and remained until 11 Apr. A photograph by Thomas D. Mangelsen was published in the Grand Island Indepedent (newspaper) and can be viewed here. Its provenance was a key issue, but based on exhaustive research by Mark Brogie, NOURC Chairman, in which no evidence could be found for captive origin, the species was added to the Official List of the Birds of Nebraska (Silcock 2011, Brogie 2012, 2013). A subsequent appeal by NOURC and others (Kendall et al 2015) to the ABA CLC was unsuccessful, as no new evidence was deemed to have been presented to the ABA CLC. The approximately 11,500 Hooded Cranes in existence breed in northeast Siberia and northern China, and winter in eastern China, Korea, and Japan. Photograph (top) of a Hooded Crane with a Sandhill Crane in Hall Co 7 Apr 2011 by Paul Dunbar. Kendall, J., M.A. Brogie, and K. Calhoon. 2015. The Hooded Crane in the ABA Area. Birding 47: 26-31. Pranty, B., J. Barry, J.L. Dunn, K.L. Garrett, D.D. Gibson, M.W. Lockwood, R. Pittaway, and D.A. Sibley. 2014. 25th Report of the ABA Checklist Committee 2013-2014. Birding 46: 26-36. Silcock, W.R. 2011. Spring Field Report, March 2011 to May 2011. NBR 79: 46-67.